Pet Peeved is a microgame found in the Touch Training stage in WarioWare: Touched! and returns as one of Orbulon's microgames in WarioWare Gold. Its name comes from the term "pet peeve", which is something that makes someone angry. The objective of the game is to poke at least one kitty that pops out of its hole. If the player pokes a kitty before the time runs out, they win the microgame, but if the time runs out without the player poking a kitty, they lose. 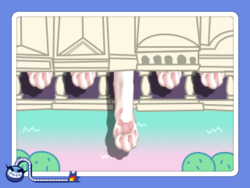 In WarioWare Gold, the player has to poke the paws of a kitty instead of their head. 1st level difficulty: The kitties pop almost all of their body, except their hind legs. 2nd level difficulty: Some kitties pop only their head. 3rd level difficulty: More kitties pop only their head. In WarioWare Gold, the player has to poke a monkey's hand. Spanish (NOA) ¡Dame la pata! Give me your paw! This page was last edited on March 11, 2019, at 17:34.